For Assignment 11, you’ll search for a skate sound and add it to a presentation. You’ll edit the sound clip so that it plays continuously throughout your presentation. Have fun! Open your Assignment10 presentation, and save the file as Assignment11. On the Insert tab, click the Audio arrow in the Media group, and choose Online Audio to open the Insert Audio window. 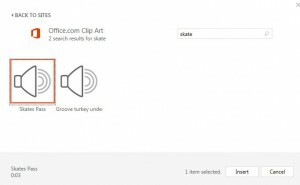 In the Office.com Clip Art Search box, type skate, and then press ENTER. The online audio clip Skates Pass displays in the window. Double-click the Skates Pass sound clip in the window; or click it and then click Insert, to add the audio clip to Slide 1. Drag the clip off the slide. In the Audio Options group on the Audio Tools Playback tab (which is active when the sound icon is selected), set the sound to start automatically in the slide show. With the sound object selected on the slide, go back to the Audio Options group on the Audio Tools Playback tab. Make sure the boxes next to Loop Until Stopped, Hide During Show, and Rewind After Playing each have a check mark in them. Click Animation Pane on the Animations tab, and move the sound effect to the top of the list. 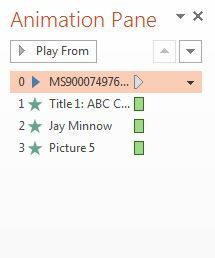 Double-click the sound filename in the animation list to open the Play Audio dialog box. In the Stop playing section of the dialog box, click the After option, and change the number in the box to 4. This will force the sound to play to the end of your three-slide presentation. Click OK to close the dialog box. On the Transitions tab, remove the check in the After check box in the Timing group. On the Transitions tab, click the Sound box in the Timing group and choose [No Sound]. This turns off the Breeze sound in the slide transition, so it doesn’t interfere with the Skate sound. Click the Apply to All button on the Transitions tab. Run a slide show, and listen for the skate sound throughout your presentation. Save your changes. Nice work! If you have any questions or problems with the assignment, please post a request for help in the Discussion Area.